The 2011 economic indicators that matter are now out. We only need to rely on the three crucial ones: the total debt or credit, the Case-Shiller house index and the labour force participating ratio (LFPR). The most important indicator of the three, of course, is total credit. This indicator can be examined from several perspectives: its annual growth as well as that of its individual components, and lastly its ratio to GDP by debt component. On the left is the first chart, depicting the total credit growth which is still flagging. It's still susceptible to falling into negative territory given that throughout 2011, the breakout from credit contraction lacked momentum, all the while hovering around the 1% mark. Let's see which debt sector was driving the flaccid debt growth in 2011. For this, the sectoral growth is shown in the left chart. This time we can see two contradicting trends, one of growth and the other of decline and ambivalence. The growth part involves only two sectors, government and non-financial businesses. Without the growth in government borrowings, the situation would have been much worse with all the other sectors showing worsening declines instead. Contrary to the Republicans' claim, it's Obama's deficits that have been holding up the economy. But not for long. As for the decliners, to wit, the financials and GSEs (Fannie Mae, Freddie Mac, and Ginnie Mae), they are still shrinking although the pace has slowed down. The US and also the whole world's financial sectors are shrivelling as banks, in a process known as deleveraging, are ridding themselves of debts on the liability side of their balance sheet, which in turn means that they need to cut down on their loan books on the asset side. This whittling down of the financial sector will continue until the total credit has reached a point that can be sustained by the economy. This undoubtedly is a long process as the US total credit which stood at 386% of GDP as at first quarter 2009, only decreased to 353% by the end of 2011. Even if the GSE debts are excluded to eliminate double counting, that still leaves a high 304%. If we look at the chart above of more than 130 years of US debt history, a level of 150%-200% would have been a sustainable number over the long-term. That means current US debt load would need to be shaved by at least one third. As banks dwindle in size, the credit or money supply will likewise contract putting more pressure on prices of equities, commodities and real estate. It is a truism that banking thrives on continuing loan growth. As loans grow, asset prices riding on the back of loans, rise as well to the benefit of both borrowers and bankers. Unfortunately, when the process reverses, bank failure is the natural outcome. During the 1930s Great Depression, a similar situation prevailed to the extent that nobody wanted to work in banking. Now the next chart shows which debt sector will dominate the rest. Throughout the current recession, the annual federal deficit has exceeded $1 trillion four years in a row. 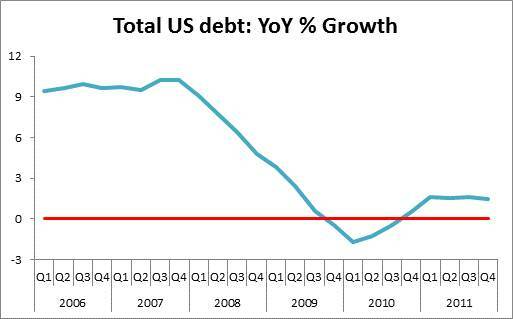 It's very obvious that government debt which has just overtaken all other debts will keep on growing. With Fannie Mae's and Freddie Mac's losses now totalling $183 billion, the GSE debt will in time fall in the lap of the government making the government debt much more higher. Although from 2012-13 onwards, the deficit is projected to progressively decrease, don't bet on this happening. Any sitting president has no control on the economy. It's the economy, or more specifically, the bond market that decides how much the deficit will be. Even the Republican presidential contenders who are pressing for a balanced budget would surely change their stripes once they are in office. When Roosevelt campaigned for president in 1932, he criticised Hoover for deficit spending. Ditto for Obama. But once they became president, they broke all budget records because if they hadn't, the bond market would see to it that they be impeached. Undeterred, Roosevelt reattempted budget balancing at the beginning of his second term. The economy soon relapsed into a recession worse than that of 1929, forcing him to backtrack. In a depression, you don't meddle with King Bond; just let it grow. In February 1993, James Carville, Bill Clinton's political advisor, presciently remarked, "I used to think that if there was reincarnation, I wanted to come back as the president or the pope or as a .400 baseball hitter. But now I would like to come back as the bond market. You can intimidate everybody." Then, the bond vigilantes sold off bonds upon hearing that Clinton would embark on deficit spending. Clinton was only saved by the massive borrowings undertaken by the financial sector and the households that allowed him to balance his budget. Now it's not the bond vigilantes but King Bond itself that decides who'd stay in power. Although lately, economic trends have been pointing towards a recovery, we should treat this as merely blips in a secular downtrend. We've been through this false hope many times. Even in the 1930s depression, there were seven such instances that subsequently left many in a worse state of despair. 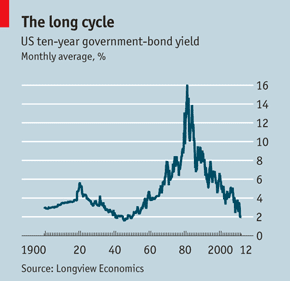 To see the true pattern, we can refer to a chart tracking the 10-year treasury yield since 1900 that The Economist has just published. The bond yield has only recently touched the 2% mark, repeating the pattern last seen in the 1930s depression. Then, the yield was down in the dumps for more than 10 years. Self-proclaimed pundits have been advising bondholders to exit bonds in the expectation that a recovering economy would push yield higher and thus bring down bond prices. Don't worry, Bernanke will see to it that the yield would remain depressed until at least 2020. Would humongous government debt lead to the downfall of any government? Actually, no. The strength of any modern government depends on the level of the country's new technology acquisition, and it's not just any technology but technology that meets the Kondratieff Wave criteria of capacity and communication. Because of this, the East Asian countries aren't likely to dislodge the US from its preeminent position, not now and never in the future. However the Fourth and the Fifth Kondratieff Waves are stuffed with technologies that empower the small at the expense of the big. This is the root cause that will precipitate the decline of the US as a superpower. The symptoms of downfall that afflicted past empires will unfold for the US in the coming years. We will witness how hard-pressed the US will be to contain its debt load as the technologies that are in ascendant now and in the future will instead favour the breaking up of large nations.